We love the hand-woven texture of this adorable little bag. 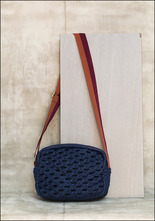 With a chic yet sporty vibe, it's super lightweight and comfy worn over the shoulder or as a crossbody. It also fits all life's essentials. > Lambskin leather body, cotton strap, metal findings. > Length: 9". Width: 4.5". Height: 6.5". > Strap length: Adjustable to 48". Strap drop: Adjustable to 21".